I had an Anton Ego moment when I had my first spoon of Fog City Creamery's Fruits & Nuts Deluxe Ice Cream and Christmas came to my mind. And I love Christmas, and have many happy memories of it especially during my childhood years. Like being surrounded by my whole family, opening presents and eating fruit cakes. I grew up with the notion that Christmas and fruitcakes are the perfect pair. My mother and aunts made the fruitcakes themselves. Alas, the fruit cake tradition ended when all sorts of chocolate cakes become popular and much more affordable. So I was really happy when I tasted the Fruits & Nuts Deluxe because it brings back memories of Christmas. 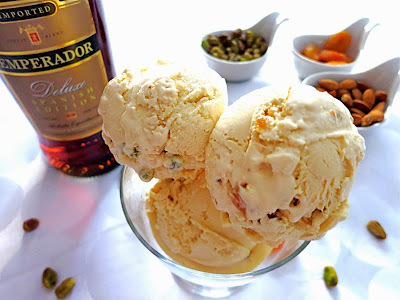 But what makes this ice-cream special is the fact that Fog City Creamery teamed up with Emperador Deluxe Spanish Edition to create this superb tasting ice-cream. 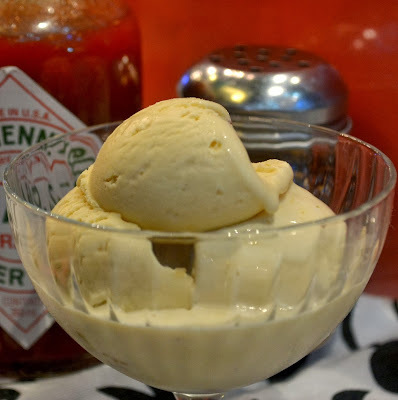 The ice cream is very creamy, smooth and rich in taste. You can actually enjoy the walnuts, apricots and pistachios which was generously included in the ice cream. There's also that subtle hint of Emperador Deluxe which I think is the cohesive factor in making this flavor a success. Of course, the launch of Fruits & Nuts Deluxe won't be complete without Ms. Edy Gamboa Liu, the beauty and brain behind Fog City Creamery and Mr. Carlos Vergara, Marketing Manager for Emperador Distillers, Inc. Both of them graciously answered questions especially about the partnership.